Students from different backgrounds shared culture, food and performances last Tuesday. The First Year Experience event brought in tastes from Africa to Asia, from the North side of the globe to the Southern side. Zaman Mohsin, a business administration student and one of the organizers, said the third edition of the event shared ideas that could gather experiences from as many countries as they could. “We have so many cultures, so much diversity on our campus that we want to bring it out to everybody enjoy and have fun,” he said. The result was different types of food to savour from several places in the world — from a Mexican hot chocolate to Northern European croissants with Nutella. Students also learned about Chinese culture and language. 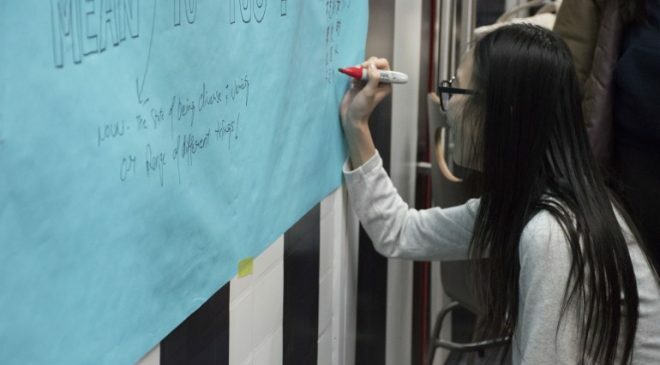 Sue Ren, a former business management student, said many people were interested in Chinese arts and sharing languages and cultures. “I wish that people don’t just [meet] with others with the same background, but that they share cultures,” she said. The Asia and Australia stand offered students green and chai tea. Traveling to Africa, just across the floor in the Student Centre, people tasted jollof rice, a one-pot rice dish popular in many West African countries. At the Caribbean stand, students ate the Jamaican patties while Kevin Machado, a justice student at the University of Guelph-Humber, performed salsa and Afro-Cuban dances on the stage. 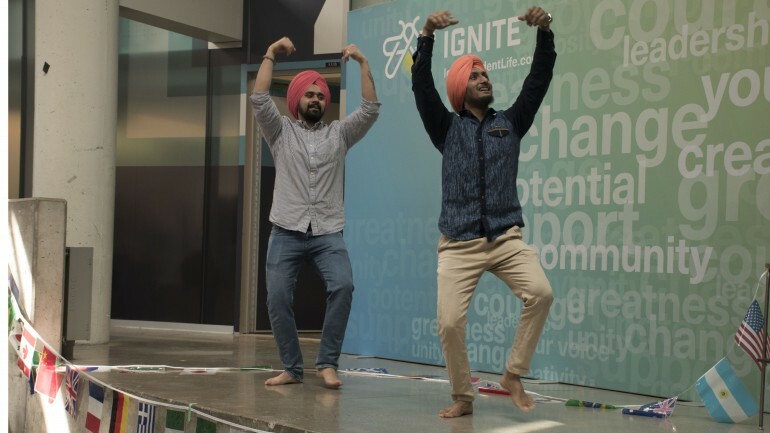 Sarbjeet Singh and Gurleen Singh, project management students at North campus, performed a traditional Punjabi dance called Jhumar. They said it’s a slow dance, based on facial expressions. “You dance for the beloved one, the one that you love, for everyone,” Gurleen said. He said one man who watched their dance said after the performance that he knew it was a love song. “Even if you don’t know the language, from our face you can know what we want to express,” Sarbjeet said. The LGBTQ+ club was also at the event to reinforce the importance of diversity at Humber College. “[The event] is important because students from different backgrounds can feel they are being celebrated,” said Sue Lewis, an animation student who is a member of the LGBTQ+ club. They also wanted to showcase the events that are coming up. “We want to invite students to come and join another safe space that students can feel accepted,” she said.